It has been almost a year since I first sampled their famous rice clay-pot dish and have been thinking about it ever since, so I corralled some of my coworkers to help me explore the menu further. 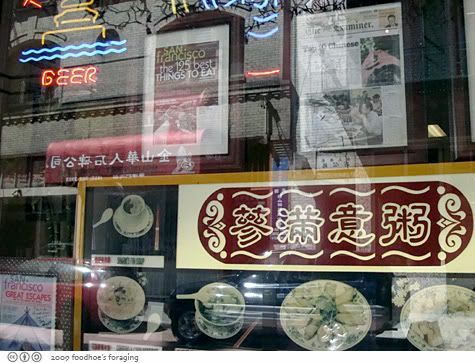 The restaurant is located on the very picturesque Waverly place and like most restaurants in Chinatown, has photos of their food displayed in the front window along with some framed press clippings. The dining room is small and we kept seeing people coming up a staircase, so there must be additional seating downstairs. 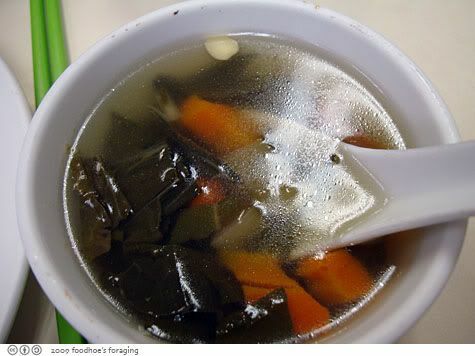 We started with complimentary bowls of soup that were surprisingly flavorful and full of fresh tasting vegetables. Jay pointed out that the Chinese characters on the sign form the word congee, which I heard was also pretty good here, so we ordered the classic combo of Congee with pork and preserved eggs ($4.25). It was not as savory as that of Hing Lung, but it was very good and had a clean fresh taste that Jay thought tasted like homemade. We forgot to order the fried bread! Claypot rice with chicken and mushroom ($6.50) arrived sizzling hot and I breathed in the delicious aroma of toasted rice. It also had a couple of pieces of Chinese sausage tucked in along with thin stalks of bright green broccoli. We poured in the small bowl of sweetened soy sauce and dug in. 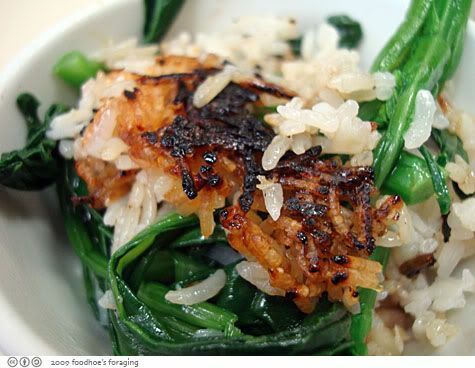 The rice on the bottom is burnt and crusty which gives the dish a faint smoky flavor. Alexson noticed Shrimp with scrambled eggs on wide rice noodles ($7.95), which I had never seen before. I love the shrimp and eggs on plain steamed rice, and it is even better served on top of a bowl of chow fun. Smear in some hot chili sauce and this is quite a dish. 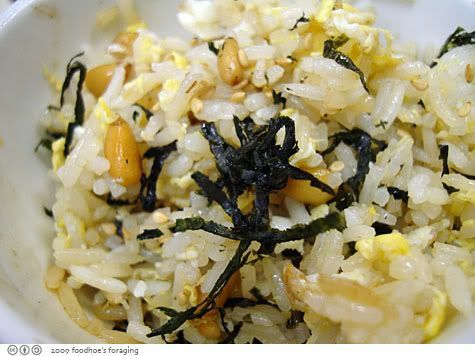 The Fried Rice with Pine Nuts and Seaweed ($8.95) sounded so interesting we had to try it. 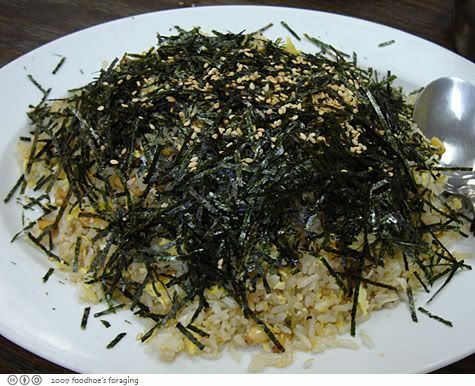 It arrived covered with thinly shredded toasted seaweed and sesame seeds. Our order of Salt and Pepper Fried Chicken Wings ($5.25) came at the end of our meal as it was ordered as an afterthought by Alexson who thought we didn’t order enough food (he always does this). These were piping hot and fresh from the fryer, the skin was fried until it was translucent and crisp. I think we weren’t as impressed with them as we would have been if they had arrived as our first course when we were all starving! I’m always happy to find another place to add into my lunchtime rotation and I can’t wait to go back to try the pork patty and cuttlefish claypot dish next time… and I hear they also serve a fried chicken stuffed with sticky rice that requires pre-ordering that sounds good too. I’ve noticed this place a couple of times but never went in. 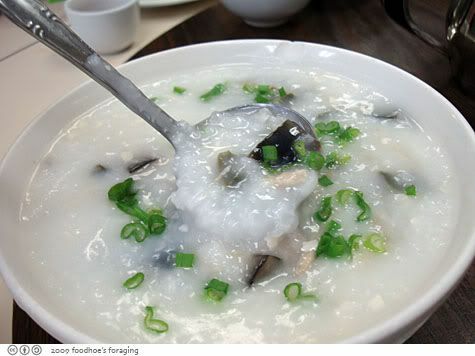 I haven’t had congee with preserved egg since I was a kid and remember really loving the texture combo! 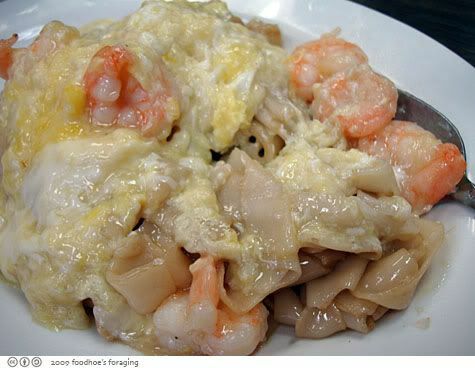 That shrimp and egg dish looks like something my mom used to make. She always added tomatoes too. SO good! The clay pot looks awesome. The rice on the bottom is always the best part! .-= hungry dog´s last blog ..Bouillabaisse, rouille, and homemade crackers =-. Woah, you guys go all out for lunch! I love seaweed on my rice. I always sprinkle those Japanese mix on my rice for dinner. .-= The Single Guy´s last blog ..Partying at South Beach (San Francisco, not Miami) =-. toasted seaweed? definitely a new one on me! i love the place’s name, by the way–i’m surprised i haven’t heard of it before! .-= grace´s last blog ..clobbered by cobblers =-. 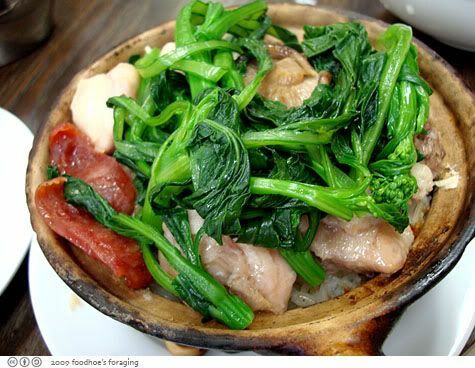 That claypot rice dish looks so nostalgic. Reminds me of times when I was a kid, eating at Chinatown cafes with my parents. I can even smell that dish still. The sweetness of the sausage, that lovely starchy aroma of the rice….mmmm, thanks for the memories. 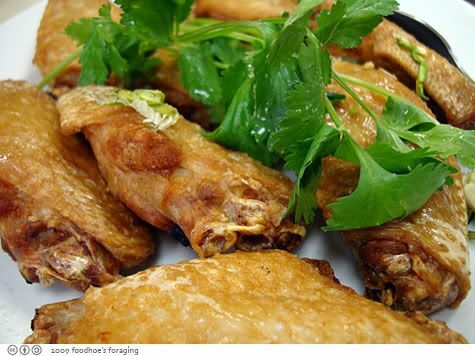 hungry dog, I love it too, I love those korean restaurants that serve the crunchy crusts with tea…. grace, its good for you too. carolyn, you’re making me hungry! It looks like they do clay pot right with a good amount of brunt rice. .-= cocochanelella´s last blog ..Nibbling at Michael Mina before Wicked =-.